There comes a time to challenge a vast, pernicious liberal conspiracy perpetrated by NASA, Neil DeGrasse Tyson, Al Gore, and the scientific community in general, all of whom want to convince the public that an utterly imaginary threat called “climate change” actually exists. 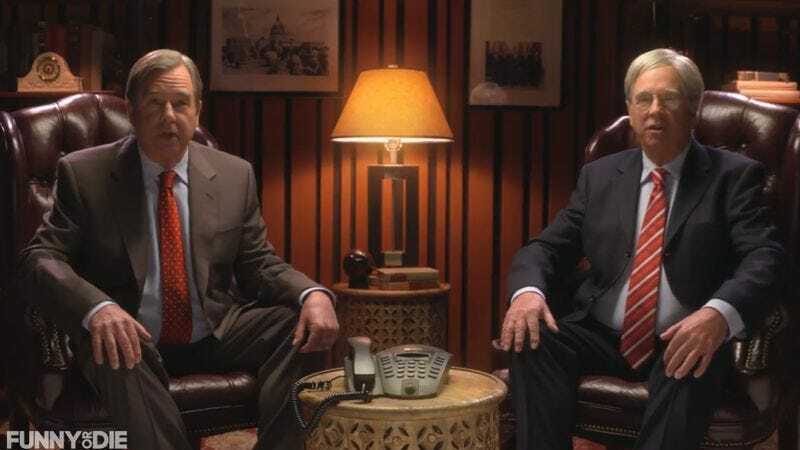 The Koch brothers, both portrayed by Beau Bridges, aim to set the record straight in a new Funny Or Die video patterned after such charity anthems as “We Are The World” and “Do They Know It’s Christmas?” At a cost of “millions of dollars,” the wealthy, conservative siblings have penned their own “Climate Change Deniers’ Anthem” and assembled “the world’s hottest conservative pop stars” to get their pro-business message across. Among the participants: Jennette McCurdy, Glee veteran Darren Criss, and the L.A. indie choral group The Silver Lake Chorus. The song’s lyrics are nothing if not optimistic and reassuring, with lines like, “We’re fine, just a little toasty weather to bring us all together in sunny harmony.” The assembled celebrities seem perfectly comfortable singing the praises of Marco Rubio and Ted Cruz while assuring listeners that “polar bears are fine.” One celebrity who doesn’t want to join the cause, however, is Last Man On Earth star January Jones. “It’s 90 degrees out in December, and you want me to deny climate change?” she snaps. It looks like the Koch brothers have a long, unseasonably warm way to go with this campaign. But, as their song points out, Arizona’s weather beats Alaska’s any day of the week.